"A generation ago, health was about avoiding fat, cholesterol, sugar and sodium in our diet. While those desires still exist for many, they no longer are growing concerns," said Harry Balzer, chief industry analyst for NDP, in a press release. "Today, increasingly more of us want to avoid gluten in our diet and right now it is nearly 30 percent of the adult population ... and it’s growing. This is the health issue of the day." The gluten-free food market is now a $4.2 billion industry, and interest has extended to the restaurant industry as well. NPD found that 200 million restaurant visits in the past year included a gluten-free order. “The number of U.S. adults who say they are cutting down on or avoiding gluten is too large for restaurant operators to ignore,” said Bonnie Riggs, a restaurant industry analyst for NDP, in the same release. Three million Americans have been diagnosed with celiac disease, which can cause intestinal damage as a result of eating wheat, barley or rye. Celiac disease is four times more common than it was 50 years ago. While the spike in those who have a gluten allergy or intolerance contributes to the increased popularity of gluten-free diets, another reason is simply the supposed health benefits of forgoing gluten. Make no mistake, gluten-free is a diet trend that has gained popularity in pop culture and the media. 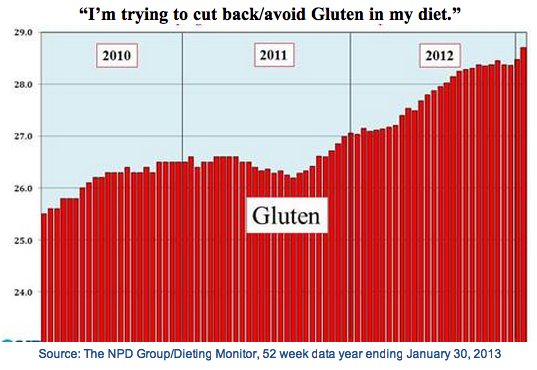 The majority of people going gluten-free are not doing so out of medical necessity.